As employers seek to define the workplace perks most likely to attract and retain employees, a survey by the Coldwell Banker Commercial® (CBC) organization found that the physical office itself could keep staff happier. According to the survey results, nearly two-thirds (63 percent) of employed U.S. adults believe that their office could better utilize its physical space, and one-third (34 percent) say improvements can be as simple as a better floorplan. 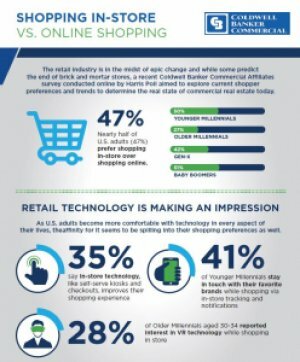 The Coldwell Banker Commercial® (CBC) organization and National Real Estate Investor (NREI) recently released the findings of the Technology Survey on the generational divide regarding the use of technology in commercial real estate. The survey finds that there is a gap in Older Workers and Younger Workers views of existing and future use of technology in commercial real estate. It addresses how each generation sees aspects like the adoption, use and importance of technology. Ultimately, each generations’ concerns come down to the impact that new technology will have on the commercial real estate industry. All ages agree that tech is important, but Older Workers and Younger Workers use it differently and have different feelings about its role in their work with clients and how it will impact their work going forward. 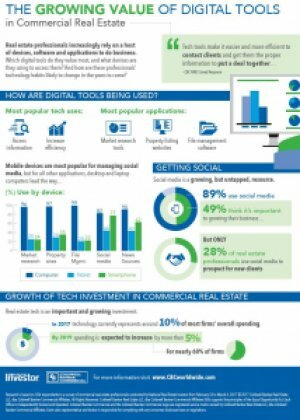 A survey conducted by NREI and the Coldwell Banker Commercial® (CBC) organization confirms that real estate professionals are increasingly relying on a host of devices, software and applications to do business. Which digital tools do they value most, and what devices are they using to access them? And how are these professionals’ technology habits likely to change in the years to come?